A charming well equipped gite set in a tranquil surrounding in the heart of Carcassone, this property offers Wi-Fi access, private parking, ground floor open-plan living area with kitchenette, one double bedroom, shower room with wc and private patio. Located on the ground floor of our home (while entirely separate and private ) it's a clean, comfortable space ideal for 2 adults or small family. The Kitchen area with oven, hob, extractor fan, microwave, fridge/freezer, kettle, toaster, basic provisions such as salt, pepper, oil, and cleaning products to save you buying them for your short stay. The open plan living area has a two seater sofa and a three seater sofa bed which transforms the room into a second sleeping arrangement. The apartment has a TV, selection of books and a CD/radio player. Enjoy relaxing whilst listening to the birds outside on the patio, a small basic BBQ is also provided. tour throughout the year, visit the many restaurants and shops within the walls of la cite, it's also beautiful by night. Walking distance from the gite, comprising of a market square (Place Carno) which is open on Tuesday, Thursday and Saturday Mornings for fresh food and flowers. Many pretty shops and cafes are here and the square hosts free concerts, festivals and events throughout the year. passing though Carcasonne. Throughout the summer you can take a boat ride along the canal with commentary - or have a leisurely stroll or cycle ride. The gite was clean and the welcome food (bread, butter, milk, jam and wine) were appreciated. Basics such as oil salt bin bags etc also provided no teabags or sugar though which would have been a bonus. Furniture in particular the bed were not particularly comfortable and creaked. The BBQ and picnic hamper were both used and appreciated. Location wise good for La Cite. Peaceful away from the maddening crowds. The location of the gite is great between the medieval cite and the main city and extremely quiet. It was good to leave the car and walk everywhere. The bathroom is clean and there was always hot water. The kitchen has everything you would need as a tourist. There are restaurants/cafes and a couple of shops about a 10 minute walk away from the gite. Given the "tourist hub" it was great to have a central location where we could safely leave the car for free and walk everywhere.This is such a bonus! The flat is spotlessly clean and has everything you need.The local grocer is really well stocked for picnic needs- Perhaps more suited for only 2 people as you have to walk through the other sleeping area to access the bathroom . We didn't mind, but maybe the bedding for extra people could have been ironed as well?. The chairs on the "terrace" could be more comfortable as we wanted to sit out for a while. The very small visitors garden could be better tended. I found myself weeding . The SKY TV didn't work but again this wasn't as issue for us. Nothing to do with the flat but be aware if you are a vegetarian, we found it difficult to find tasty meals out - maybe seek some reccomendations-. This is really a place to seriously consider if you are making a stop in this city because the location is TOP rate and you will be perfectly comfortable. The only issue with this place is we didn't schedule to stay longer. Large bathroom was great along with the rest of the place. Nice spot to sit outside in the garden which was perfect after being in city apartments for the 4 days prior. Having the high chair and playpen was great for our daughter was fantastic. Very friendly owners as well. We spent a very enjoyable 5 nights at the gite. it is well equipped and comfortable, thank you for making us so welcome Julianne & the goodies we found in the fridge on arrival were a lovely surprise! Although its located some distance from the Cite or Bastide, about a 15 minute walk, we enjoyed walking off some of the calories we ate. The walk through the park and over the Aude visa the foot bridge was lovely. Also we found lots of good places to eat about 5 minutes away near Le Vieux Pont. We would recommend the gite to family & friends. My partner and I found this gite to be an ideal location for exploring the wonders that Carcassonne has to offer. We sought out new adventures during the day and relaxed here during the evenings which was wonderful. The cite is only a few minutes walk away and there are many places to enjoy walks with a close by play park for children. The owner of this property is lovely and very helpful which always makes the holiday experience better. We enjoyed it so much we can't wait to go back! L'ile is nicely situated in the heart of Carcassonne city, a small Island well-known to locals as a haven of peace and tranquillity. 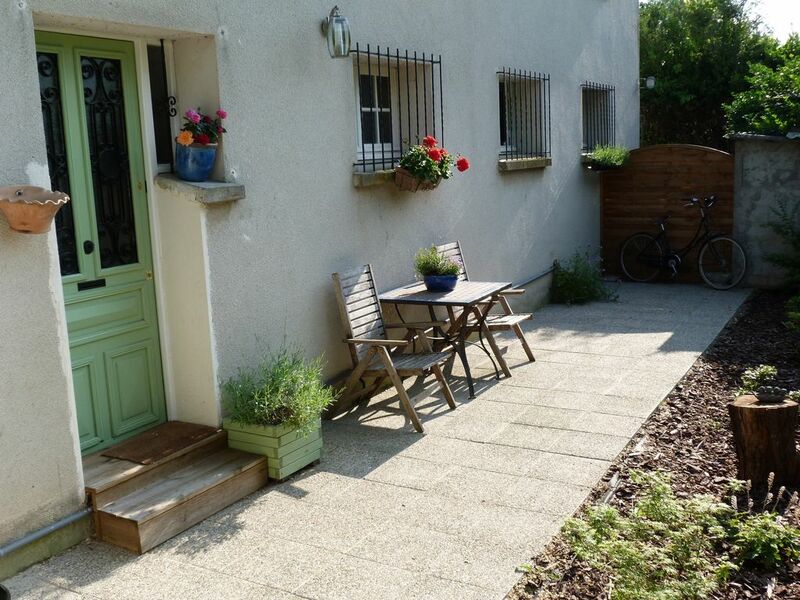 Ideal for walking, cycling or just relaxing on the shaded patio, our gite also has the added benefit of being just minutes walk away from the hustle and bustle of the Medieval walled city of Carcassonne, the Bastide St Louis, and the Canal du Midi. A car is not necessary although if you do have a car it is an ideal base for exploring the area, which is rich in historical sites such as the Cathar Castles and stunningly beautiful scenery and villages of which surround Carcassonne.